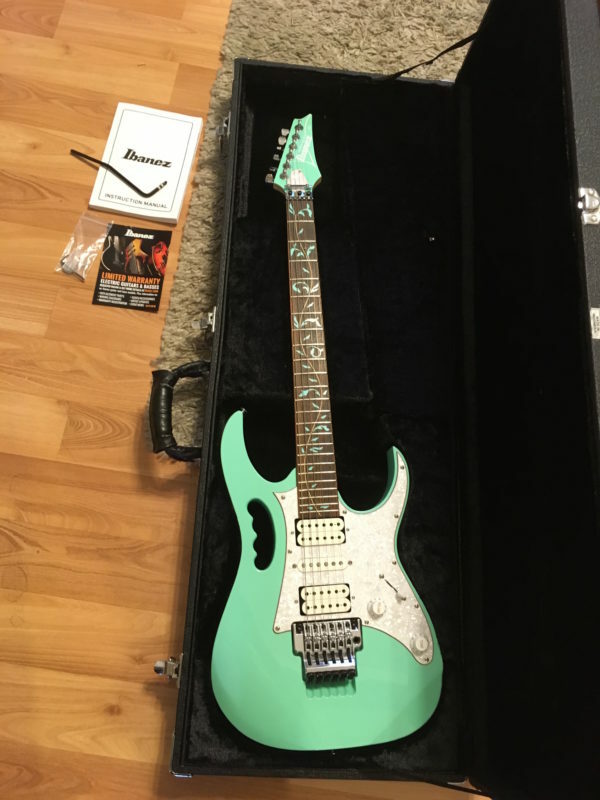 Ibanez JEM70V Steve Vai Signature Guitar Sea Foam Green in mint condition with deluxe Ibanez hard case. Awesome Ibanez Steve Vai Jem 70V in Sea Foam Green. 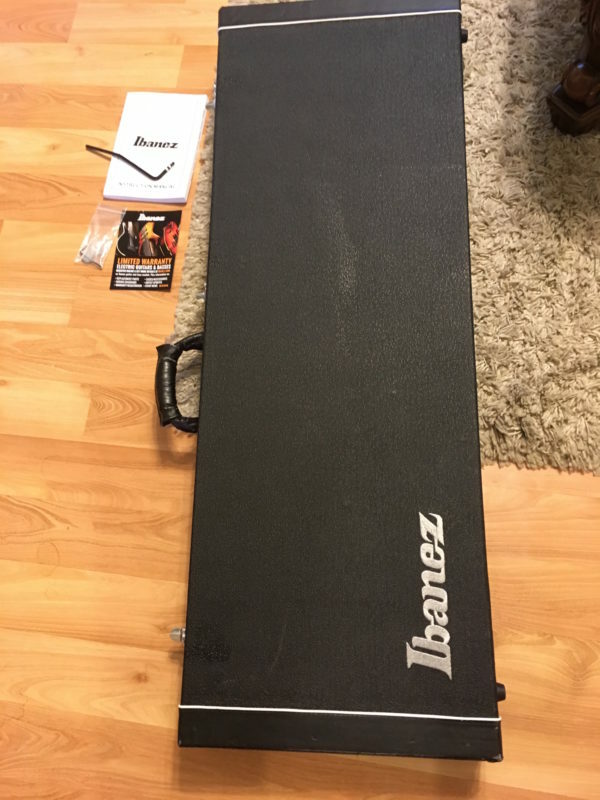 Mint condition, comes as pictured with deluxe Ibanez hardshell case, trem bar, manual, etc. Great Jem that has seen zero play wear. Enter the Ibanez Steve Vai JEM70V solidbody electric guitar, designed to keep up with the fastest and most intricate players. 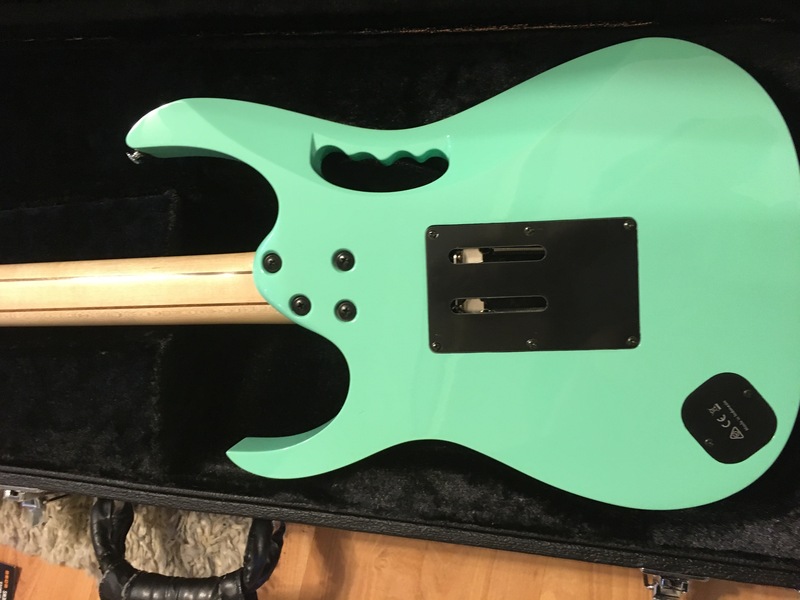 The JEM70V pays tribute to the incredible musical versatility of Steve Vai, sporting a basswood body for a classic tone that handles your lead and rhythm work equally well. 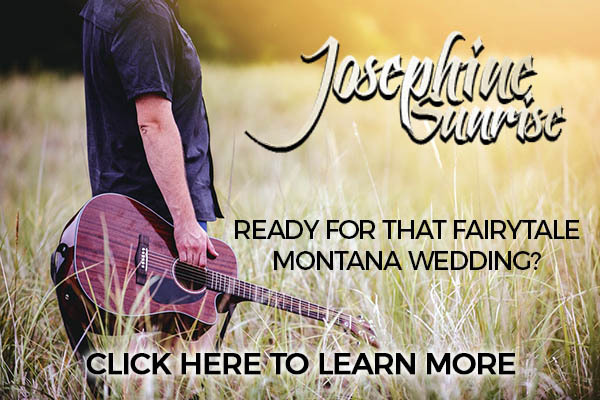 If you need a flexible instrument, then this is the guitar for the job! The JEM70V’s packed with three special DiMarzio pickups – a pair of humbuckers for articulate tones and a hot single-coil for added attitude. 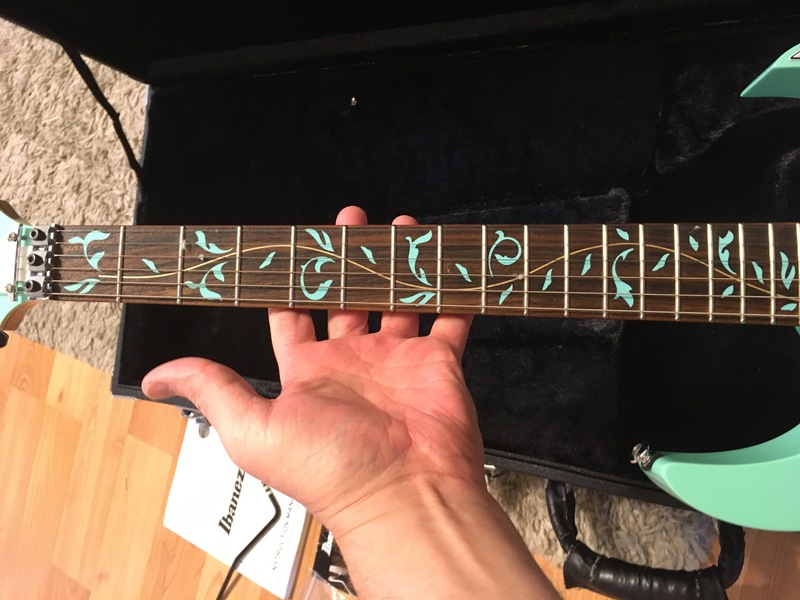 Every detail that made Steve Vai’s signature model such an iconic guitar are here, right down to the built-in Monkey Grip handle and the Tree of Life fretboard inlay. 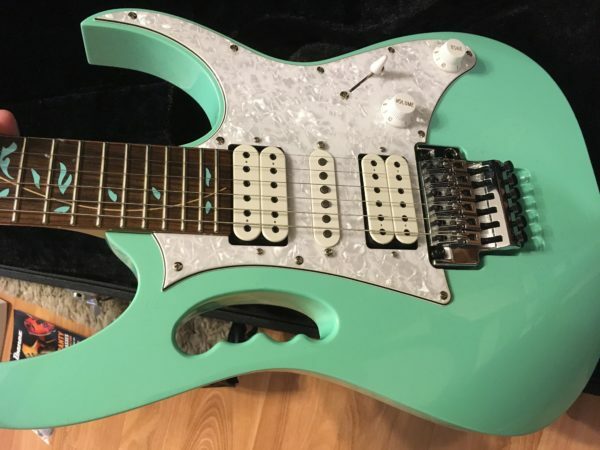 Just plug into a killer tube amp and hold on – the Ibanez Steve Vai JEM70V solidbody electric guitar is ready to rock! 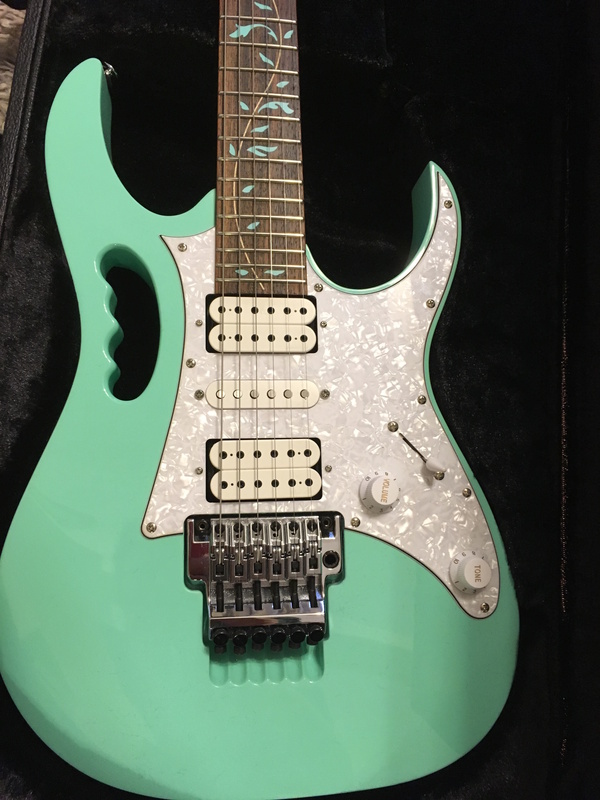 Built to the performance requirements of Steve VaiIncredible performance is the reason Steve Vai continues to play his Ibanez signature models on tour and in the studio, and the Steve Vai JEM70V doesn’t disappoint. The solid basswood body and 5-piece Wizard III neck give you sustain that won’t quit, as well as a lively response for excellent note-to-note definition. The JEM70V has the rich, warm tone needed for sultry rhythm work, and you can switch to a full-on biting midrange attack for lead work without missing a beat. It’s truly musically versatile, just like Steve Vai. 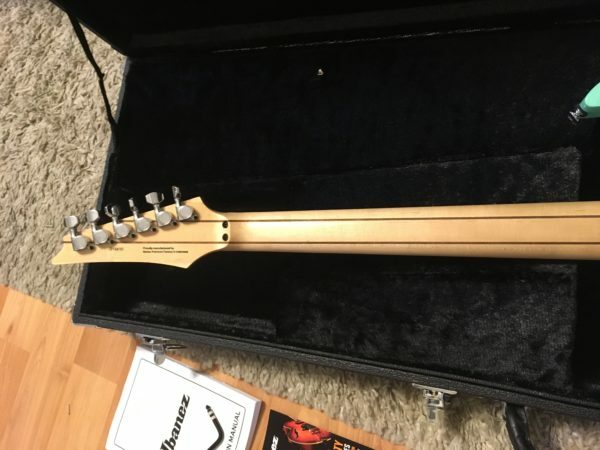 Effortless playability with the fastest-playing neck in the businessOne of Ibanez’s fastest necks to date, the 5-piece maple and walnut Wizard III neck on the Steve Vai JEM70V is an absolute pleasure to play. This slim and super-comfortable neck lets you pull off lighting-fast runs and arpeggios with ease, but it still gives you the substance you need for fretting chords when you need to. From the first time you put your hands on the JEM70V’s Wizard III neck, you’ll know you’ve got a guitar that was built with performance in mind. 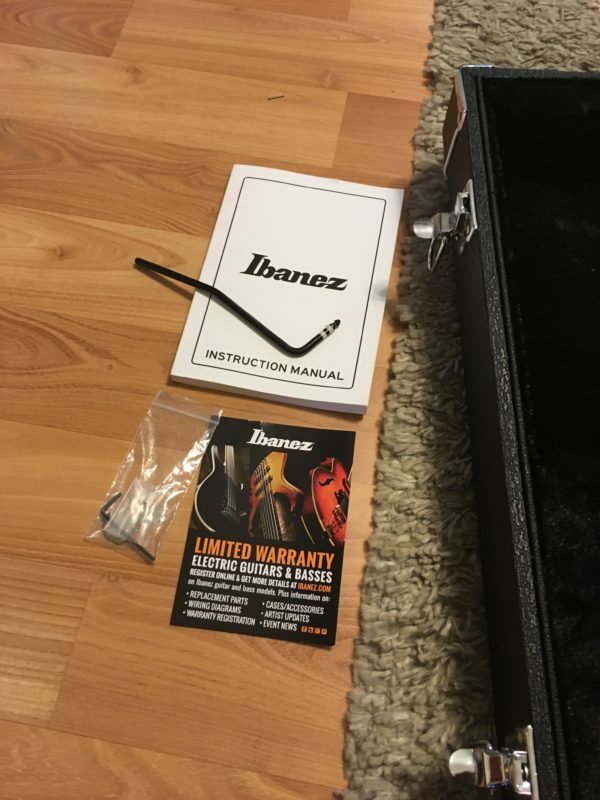 Edge tremolo for precise tuning stabilityThe JEM70V’s Edge tremolo was designed by Ibanez to give you the fast tremolo response and snap you need to pull off sharp bends and flutters. The extreme stability of this knife-edge-style trem’s stud lock function is also one of the many reasons its a favorite among many of today’s top shredders. And thanks to the Lion’s Claw tremolo cavity, you can bend notes to radical extremes and back again with incredible precision.